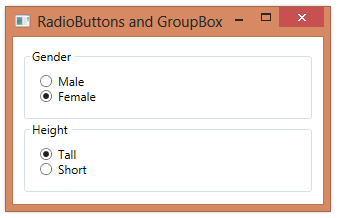 When including a group of RadioButton controls in your application, it’s common to put them in a GroupBox. This makes the grouping visible to a customer. A related group of RadioButtons are normally placed in a panel control, to allow the grouping logic to work correctly. (Only one RadioButton at a time is selected within the group). Because a GroupBox is a ContentControl, rather than a Panel, you’ll want to place a panel within the GroupBox and then place the related RadioButtons within the panel.